Cameroon's President Paul Biya has promised Nigerians living in the Bakassi peninsula that their security and their rights will be guaranteed. Nigeria handed over the potentially oil-rich area to Cameroon last Friday. 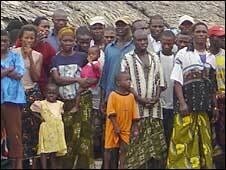 It prompted many Nigerian residents to abandon their homes fearing the arrival of Cameroonian troops. "I want to reaffirm that Cameroon will honour all the commitments made concerning our Nigerian brothers and sisters," Mr Biya said. Bakassi was ceded after the International Court of Justice ruled in favour of Cameroon, ending the long-running dispute over the peninsula's sovereignty. The court's judgement was based on an early 20th century colonial agreement between Britain and Germany. About 90% of the area's population, estimated at up to 300,000, is made up of Nigerian fishermen. President Biya made his assurances during a speech on national TV and radio. "This is a new era of peace and fraternity between Nigeria and Cameroon," he said. Hope they keep to their promises!